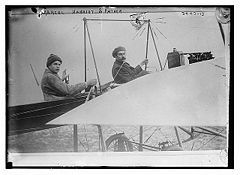 Picture - Marcel and Rene Hanriot in 1911. The Hanriot company was a French aircraft manufacturer. Following pioneering work, mainly with monoplanes, Ren� Hanriot established a new company, Aeroplanes Hanriot et Cie in 1914. At first a manufacturer of components, and then a subcontractor producing aircraft (notably the Sopwith 1� Strutter and Salmson 2) to other companies' designs, from 1916 the Hanriot company resumed the development and manufacture of its own aircraft, to the designs of Pierre Dupont. The first and most famous of these types was the Hanriot HD.1, a small single seat biplane that served several air forces as a fighter and advanced trainer during World War I and well into the 1920s. In 1930 the Hanriot company became part of the Lorraine-Dietrich company under the name Lorraine-Hanriot. The company separated from Lorraine in 1933, becoming independent under Ren�'s son Marcel. In 1936 the company was included in Pierre Cot's nationalisation programme, forming part of the Soci�t� Nationale de Constructions A�ronautiques du Centre. Marcel Hanriot served as the first chairman of the new company. Hanriot Pictures and Hanriot for Sale.